Kanaka Durga Puja Vidhi – Procedure – With Mantra – How To Perform Kanak Durga Devi Puja? Kanaka Durga is a benign, kind and loving form of Mother Goddess Durga and she is worshipped for attaining worldly success and prosperity. Below is Kanaka Durga puja vidhi or procedure along with mantra. This is a simple guide on how to perform Goddess Kanak Durga Devi Puja and is ideal for performing it at home. When to Perform Goddess Kanaka Durga Puja? Shukla Paksha Dasami Tithi – tenth day during the light or waxing phase of moon. Ashwini or Ashwathy Nakshtra day in a month. It is doubly auspicious to perform the puja when Ashwini or Ashwathy Nakshtra coincides with Dasami tithi. 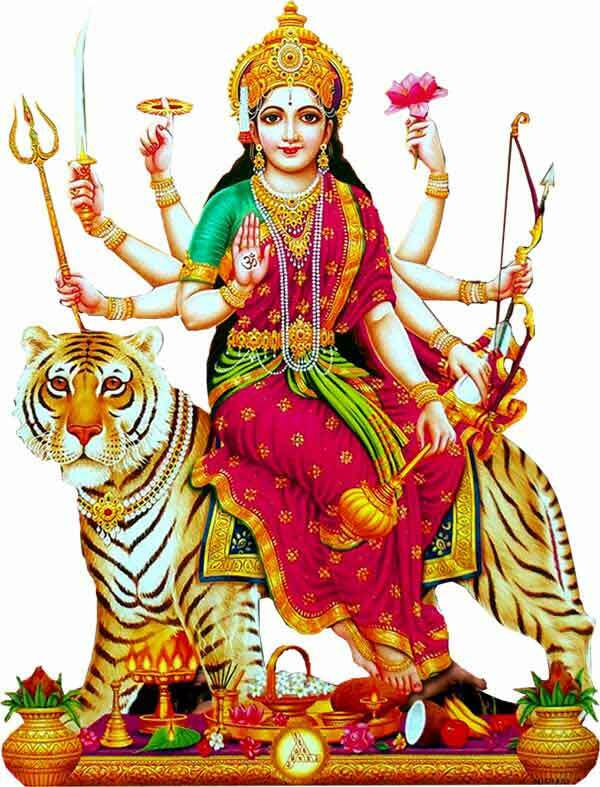 Even the toughest problems in life becomes easy after offering prayers to this form of Durga. Arjuna offered prayers to the Goddess to attain Pashupatastra from Shiva. Indra performed intense austerities to get her blessings. The puja should be performed early morning after sunrise or during the pradosh period (1.5 hours before sunset). The murti (picture, photo or painting) of Goddess Kanaka Durga worshipped should be yellow in color. Kind form hers having blessing posture should be used. It should be placed on a red color cloth. The puja should be performed facing north. The person performing puja should wear yellow color clothes. A bronze lamp should be used. The lamp should be lit using cow ghee. One wick is preferred. Yellow color flower should be offered especially marigold flower. Dhoop should be of fragrant flowers. Offer dried red color whole chilly. Tilak should be of kesar. The bhog or Prasad or naivedya on the day should be prepared using Jaggery (gud) and yellow color chana dal. It should be later given to a cow. The mantra ॐ कन्यकायै दुर्गाय नमः॥ should be chanted 108 times. The count should be kept on a yellow chandan mala. To have solve all types of delays in work, offer misri or sugar candy or kalakanda to Goddess and then consume a bit as Prasad. To overcome financial problems, offer dried whole chilly (mirchi) to Goddess and later keep it in the locker in the house. For peace and happiness in the family, offer uncooked wheat to Goddess and later keep it in the south side of the house.